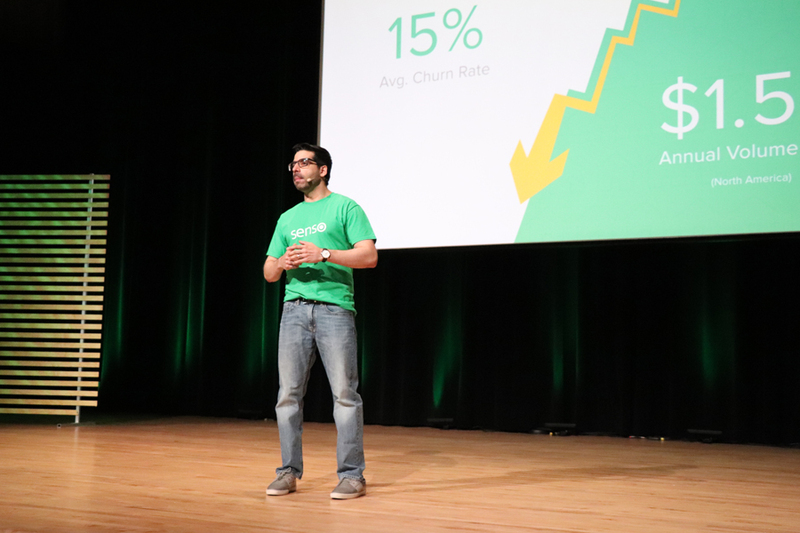 TORONTO – On Thursday, international startup accelerator network Techstars revealed its first class from Ontario’s capital, a series of 10 tech startups – some of them with roots from outside Canada – that are disrupting data management, digital identification, and more. 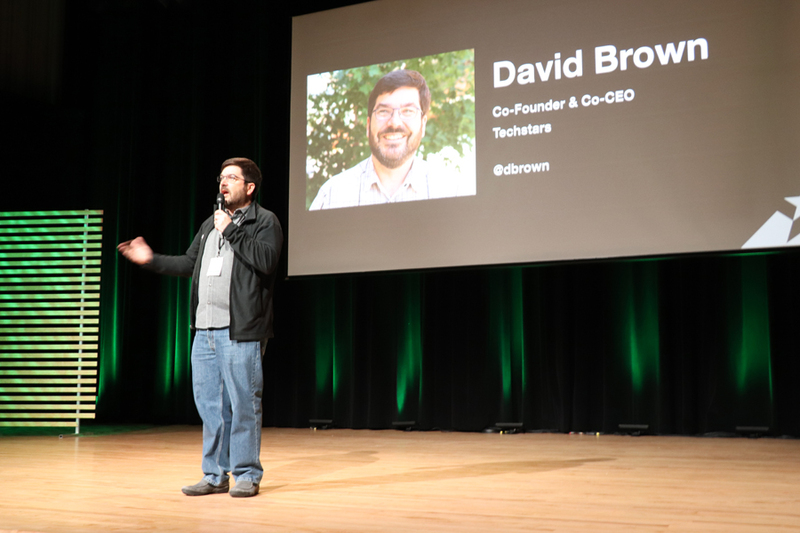 As Techstars co-founder and co-CEO David Brown (above) noted, the 1200 companies that have enrolled in Techstars’ eight-week mentorship program so far have raised an average of $2 million USD each after demonstrating their products for investors on one of the company’s “demo days,” with 80 per cent still in business, 10 per cent acquired, and only 10 per cent having failed. So the Toronto class, whose own demo day was held on April 19 at CBC headquarters’ Glenn Gould Studio, is in good company. With files from Brian Jackson. An anti-tech tech company (though they didn’t call themselves that) Flipd is an app designed to reverse our collective addiction to our mobile devices. 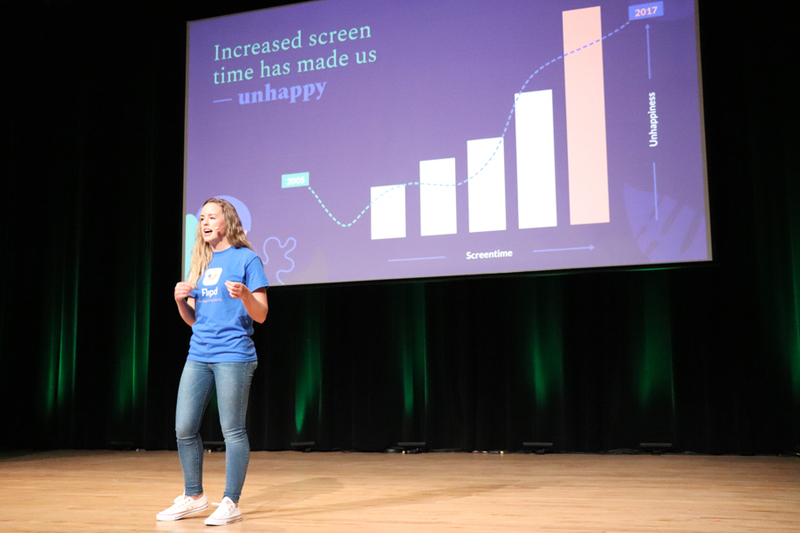 After all, as co-founder and CMO Alanna Harvey (above) noted, the average user now spends five hours on their phone per day, instead of, say, exercising, sleeping, or spending time with family and friends – and there’s a correlation between screen time and unhappiness. “We all know technology was engineered to be addictive, but what if we flipped the script?” she said. According to Harvey, the company has already helped more than 250,000 people so far, and has an average monthly user base of 45,000 and a primary audience of, believe it or not, postsecondary students. Senso co-founder and CEO Saroop Bharwani (above) calls his company’s service “mortgage retention reimagined,” and there’s definitely a market for his product, with an estimated $1.5 trillion USD in annual payments in North America alone, along with a 15 per cent churn rate – that is, customers switching lenders. The result: Lenders are losing an estimated $40 billion in revenue over the next three years to wayward customers. Senso solves this problem using machine learning, analyzing thousands of features over an amortization period including geospatial, real estate, credit, economic, and rate change data in order to recommend the best method businesses can use to retain customers – and they’re already working Canada’s largest bank and a leading subprime lender. “By predicting mortgage churn with higher degrees of accuracy that industry average, we’re eliminating churn and improving revenue,” Bharwani said. 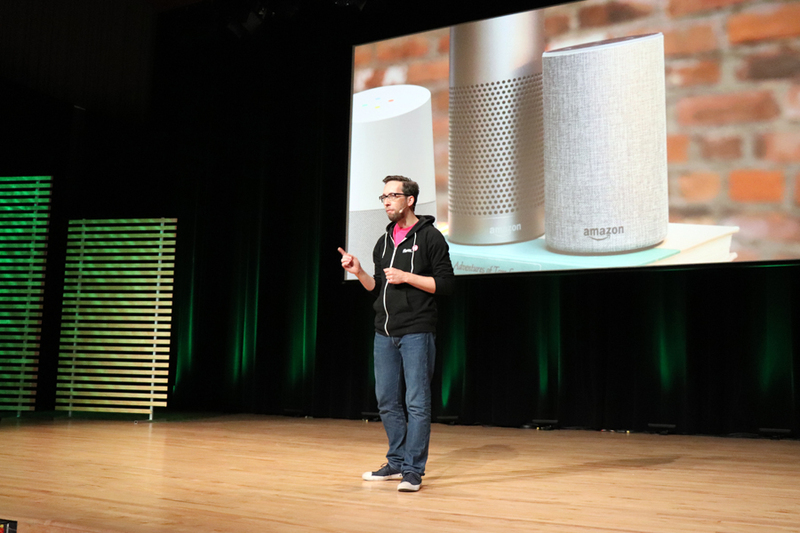 Voice assistants barely existed a decade ago, but today they’re a $38 billion industry, and Flow.ai co-founder and CTO Sander Wubben (above), who hails from the Netherlands and calls his platform “the PhotoShop for voice design,” wants to help companies take advantage. Simply put, Flow.ai has multiple conversational models built into its engine, allowing companies to easily integrate just about any service they can think of with Alexa, Google Assistant, Facebook Messenger, and Salesforce. One of its most prominent customers, Samsung, has already used the Flow.ai platform to reduce the development time of its Bixby voice assistant by 70 per cent. Though it only opened for business in November, Flow.ai already has 4000 users, and has experienced 19 per cent monthly growth. Users can start with a freemium account, graduating to a monthly account with considerable technical support once their application becomes popular. Read more about it here. 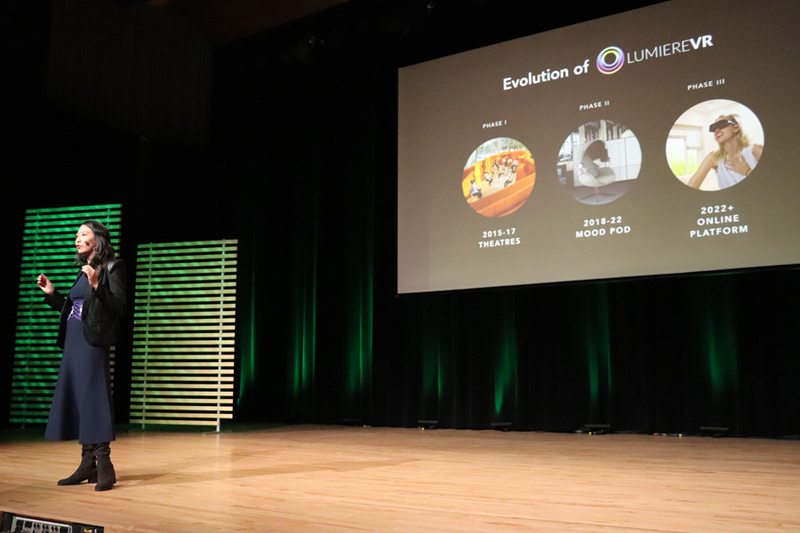 The virtual reality industry might not have reached the heights its most ardent supporters had hoped for – yet – but as LumiereVR co-founder and Chinese filmmaker Jenny Guo demonstrated, there’s a clear audience for the platform this time around, and it doesn’t require everyone to invest in their own equipment. In fact LumiereVR is positioning itself as a sort of virtual reality arcade franchise, with ready-made pods designed for a variety of businesses including museums, malls, and, believe it or not, offices, with a $500-per-unit subscription offered as the ultimate perk for relaxation. The company, which is backed by market leader HTC Vive, plans to launch a beta site with 20 pods later this year, and is planning to eventually scale up to 125 locations. We’re having a difficult time not simply calling this device a glorified pressure cooker and moving on, but there’s an undeniable demand for the service KitchenMate offers: convenient, high-quality, and affordable office lunches. 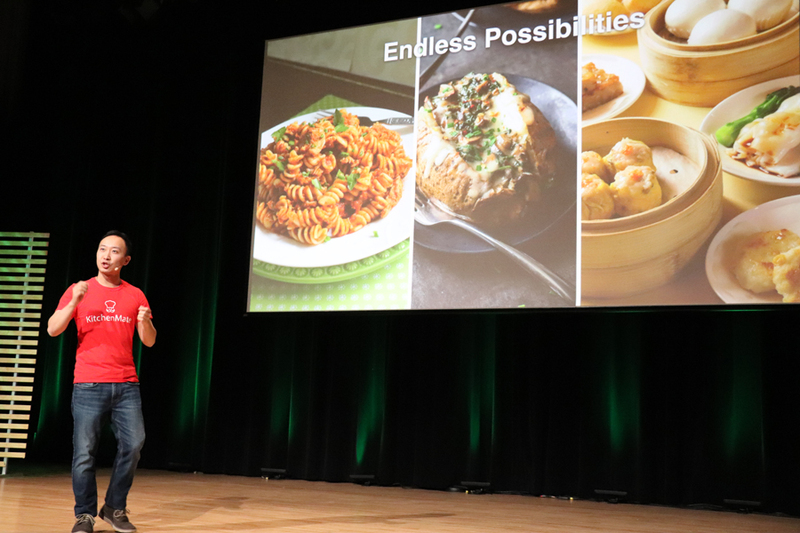 According to KitchenMate CEO and founder Yang Yu (above), offices can easily rent one or more KitchenMate devices and subscribe to a meal delivery service that will deliver fresh ingredients (which, in photos shown during his presentation, appeared to be packaged in aluminum containers) that can be transformed into a hot meal at the push of a button. The secret, he said, is that where other appliances add heat, the KitchenMate adds water. But there’s no denying the meals Yu showed off looked delicious, and his company handles all of the maintenance. It’s already on track to serve 10,000 meals per month by the end of April. Anyone familiar with the headaches caused by data management will appreciate Cinchy’s digital version of aspirin, which allows enterprises to re-use data across multiple platforms. 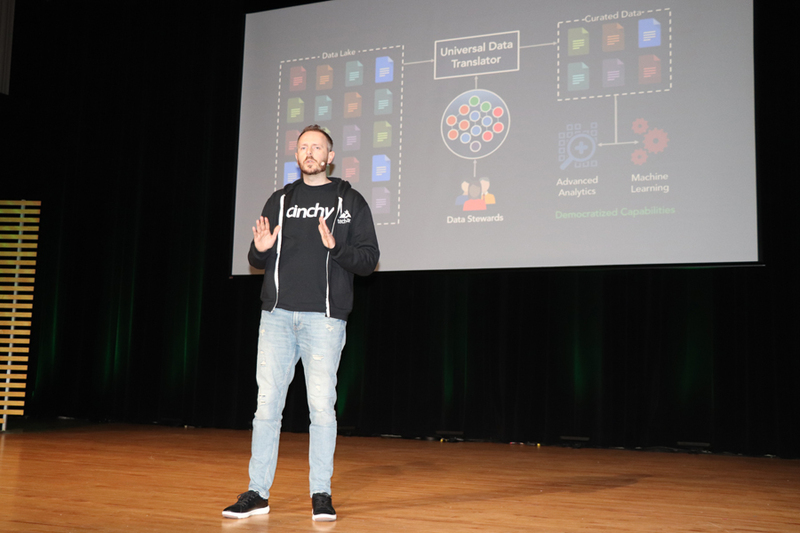 Today, integrating data is difficult and expensive, Cinchy co-founder and CEO Dan DeMers (above) explained, because every application uses a separate database. “What makes us unique is we are eliminating this as a constraint,” he said. Cinchy essentially converts your company’s data into a network, similar to a website, which allows new systems to instantly access data without duplicating it – meanwhile, the data itself remains secure, version controlled, recoverable, and in your company’s hands. Launched in November, Cinchy is already working with three of Canada’s big six banks. It might be synonymous with the likes of AirBNB and Uber today, but the one of the gig economy’s oldest symbols, multi-level-marketing-based beauty companies such as Mary Kay and Nu Skin, involves little tech and represents a ripe opportunity for digital transformation, one that Nikita Leonov (above), Elmy’s Ukraine-born CEO, is all too happy to embrace. Elmy, which ITWC editorial director Brian Jackson wrote more about here, allows what Leonov called “beauty freelancers” to create professional profiles and showcase their work, potentially helping them build their client base. In return, Elmy charges 50 per cent of each new client’s first booking, an arrangement that Leonov says represents a $100 billion market opportunity. In its three months of existence, the company has connected more than 1000 freelancers so far. Did you know that one out of every five shots served in an alcohol-selling establishment is unaccounted for? We didn’t, but for unlucky bars that can mean 20 per cent of the bottom line being lost to overpouring, spillage, or theft. “Imagine you were selling TVs and one out of five went missing. 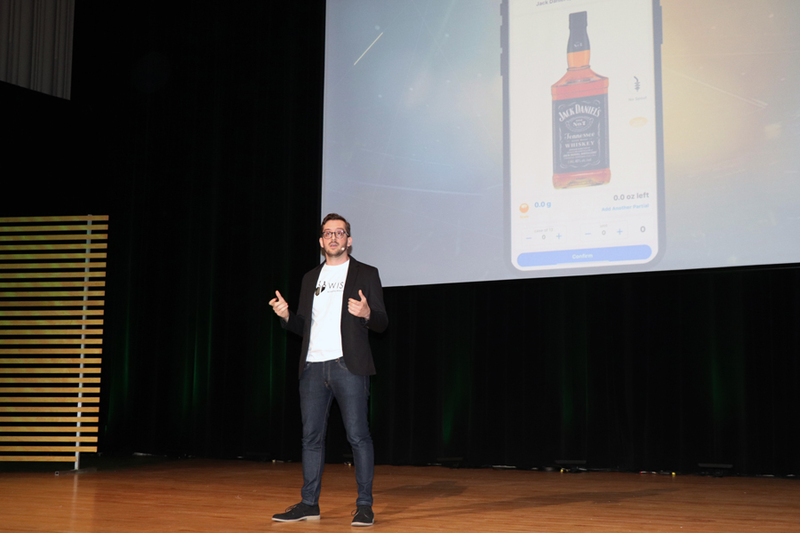 You’d probably start doing inventory,” Wisk co-founder and CEO Angelo Esposito (above) told the demo day audience, while acknowledging that tracking bottled alcohol has long been considerably more difficult than tracking televisions – until now. According to Esposito, Wisk transforms what largely remains a pen and paper process into a mobile app-based digital one: Scan the bottle, measure the liquid using an on-screen slider, and Wisk will keep track of the number of ounces left. Wisk charges $250 per month for this service, to address what Esposito called a $2.7 billion problem. Its clients already include Las Vegas gaming giant Ceasars Entertainment. Construction is big business, accounting for more than $1.8 trillion of Canada’s GDP in the fourth quarter of 2017 alone, and according to Tread CEO and founder Noah Dolgoy (above), the hiring of heavy equipment on its own is worth $2.5 trillion per year. It’s also largely done on paper and involves numerous subcontractors, a time-consuming process that leads to estimated yearly losses of $100 billion – and a digital transformation opportunity. 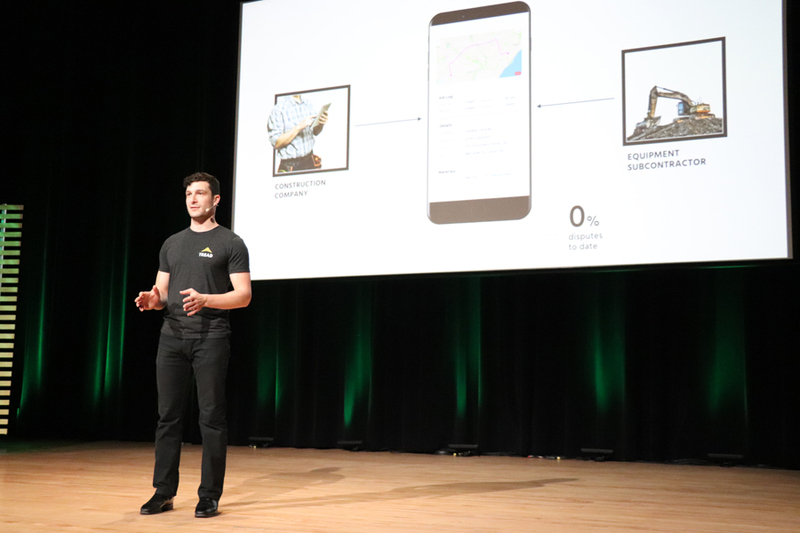 By digitally tracking sub-contractors by location and performance, Tread helps construction companies become more reliable performers and eliminates disputes over invoices. In fact, Tread has no disputes on record thus far, and has yet to lose a single customer. One client actually saw productivity improve by 15% overnight. So far, Treads is bringing in $100,000 in business, and Dolgoy anticipates that will increase to $25 million by the end of the year. 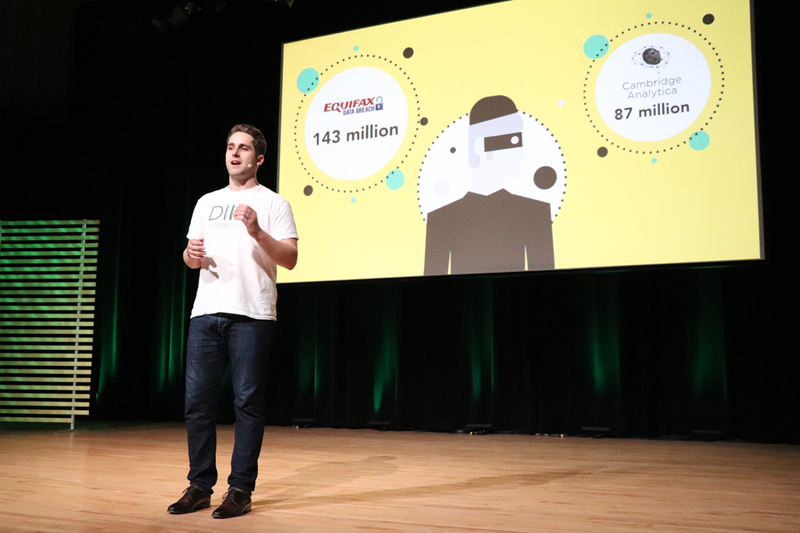 As last year’s Equifax data breach and Facebook’s ongoing Cambridge Analytica scandal illustrate, consumers have far too little control over how their personal data is used, Distributed ID CEO Merrick Reid told the demo day audience. 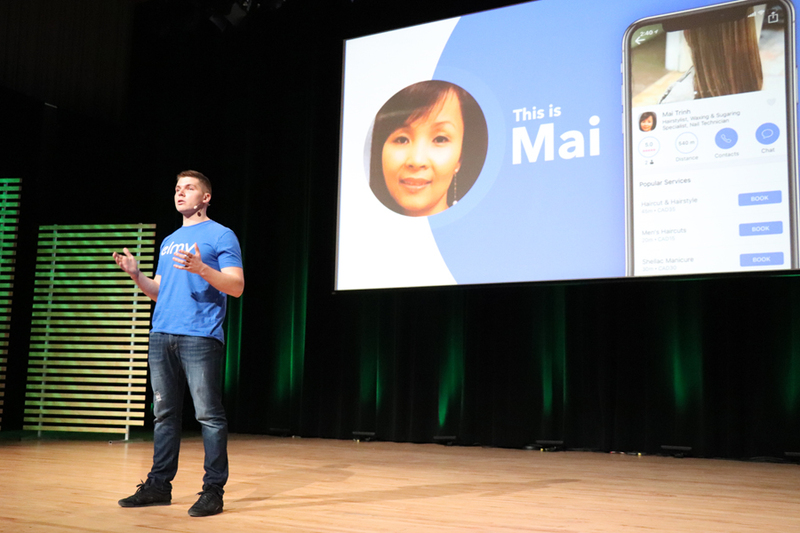 True to its name, Reid’s company aims to bring some control back into users’ hands, by applying blockchain technology to identity verification. To solve the financial industry’s trust problem, Distributed ID is creating a shared identity management marketplace that, thanks to partnerships with Chinese banks, is expected to support nearly one-tenth of the global population by the end of 2018. And the company plans to open up its ecosystem for payments, personal health data, and social media data too.